We all hike for various reasons – to get exercise, to get outdoors, to enjoy nature, spend time with family and friends. Most of us probably do it for at least more than one reason. One of the best parts of hiking for me is the sights and sounds of nature. Many of my hikes take me to nearby North Park, the largest of Allegheny County’s nine park system. This year, we have a pair of nesting eagles at the park! It has been an exciting time for our region – the eagles were first sighted a few years ago in North Park, but this is the first year that they have built a nest. It is believed they have an egg, but as of this minute, it doesn’t appear that it has hatched (or if it even will, but more about that later). As most folks know, the bald eagle is the national emblem of the U.S. – since 1782 as matter of fact. They are called “bald” because of their white-feathered heads that stand out from their dark brown bodies. The under-feathers on their tails are also white. 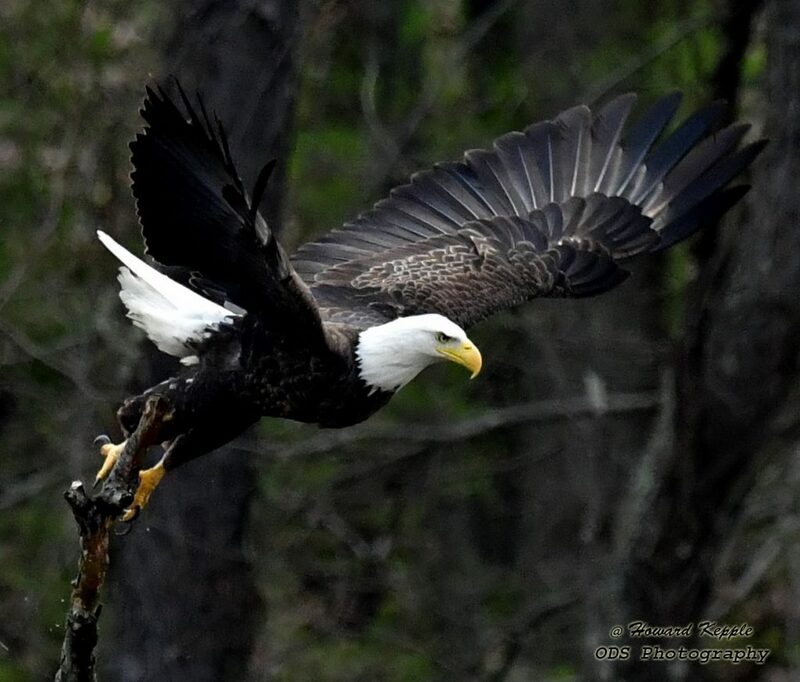 For years, the bald eagle wasn’t very common in Western PA but fortunately, that has reversed thanks to protection laws and the efforts of many. 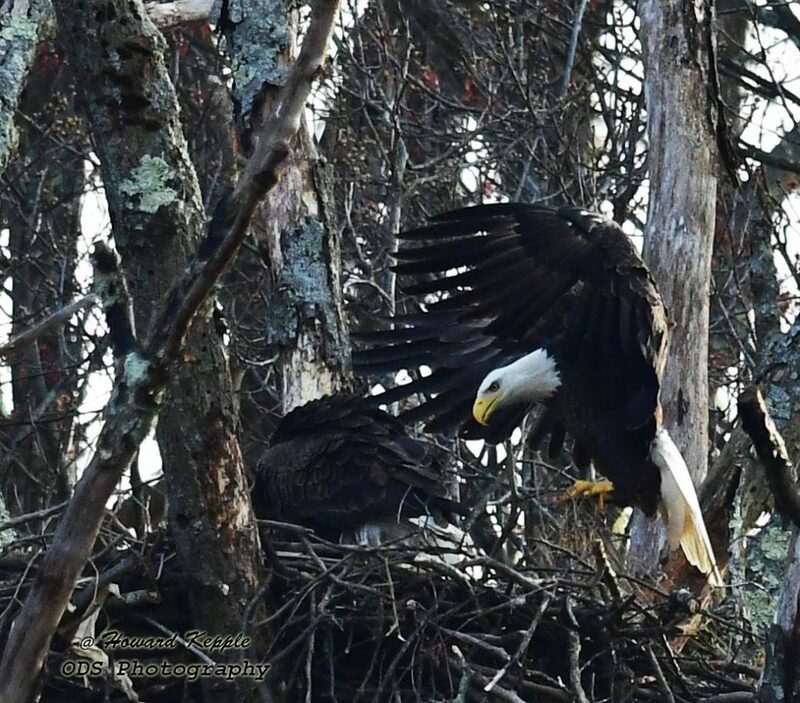 Eagles tend to nest in forested areas located near large bodies of water. This is the case in North Park – the eagles’ nest is perched high in the trees near the lake. The first time I spotted one of the eagles was when it was sitting above the lake in a tree, scouting for dinner – eagles like tall trees so they can get a good view of their surrounding area. Eagles like to eat fish – thus the preference for lakeside residences. They also like small animals and even other birds. Some other fun facts: they mate for life, live to be about 20 years old, weight between 6 to 14 pounds and they usually migrate during the winter. It isn’t uncommon for young eagles to hang out in an area for a few years before they start nesting, according to Meg Scanlon, park naturalist. And when they do build a nest, they still may not lay eggs. AND even if they do lay eggs, they may not be viable eggs. Geez, seems like a lot of ifs. In our region, eagles typically lay two eggs in mid-to-late February and then both the male and female will sit on the eggs, taking turns. The eagle chicks hatch in approximately 35 days. In 10 to 12 weeks, the young eagles will begin to fly and leave when they are five to six months old. It is hoped that the North Park pair’s egg(s) will hatch this week. Again, not all eggs are viable, so it may not happen. The pair in North Park has gathered quite a following – they even have their own Facebook page, North Park Bald Eagles. Anyone who enjoys wonderful photos should visit the page and join the group! One of the administrators, Howard Kepple, has generously allowed me to use his photos for this blog. Receive our latest posts by email! How many miles will you hike in 2019?